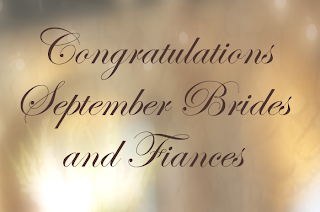 Congratulations to those married or to be wed, as well as those engaged in September? This is your month to tell us how he proposed to you. Light gusts of wind sweep up swirling golden leaves as the sweet scent of pine cones and pungent fallen apples fill the air. It's a virtual fest for butterflies, sparrows and other creatures great and small. The time of harvest as arrived and with that it's time to carefully store away a fruitful season of growth and memories. Did you know that. September begins on the same day of the week as December every year. September means 7. That said, It was originally the seventh of ten months on the oldest known Roman calendar. The ninth month of the year in the Julian and Gregorian Calendars and one of four months with a length of 30 days. September's birthstone is the sapphire. Sapphire is a gemstone variety of the mineral corundum, an aluminium oxide. Trace amounts of other elements such as iron, titanium, chromium, copper, or magnesium can give corundum blue, yellow, purple, orange, or a greenish color. With its Mohs hardness of 9, second only to diamond, is one of the most wearable of all gemstones. The birth flowers for September are the forget-me-not, morning glory and aster. Whether you were proposed to in the month of September or were wed tell us your story and send it to someone you love. The "7 Days Before The Wedding Countdown Planner Checklist Bookmark" Makes a great gift and can be used as a printable graphical template for many different craft projects. Print it on a commemorative T-shirt. Print it on a fabric neck scarf. Print it on a fabric hair scarf. Send it to all the Brides-to-be you know. Print on a tall mug (cut in three sections). Print on a slim poster. Print on sticky paper for a scrapbook countdown timeline. Print and stick to the side of your monitor display. Print and attach to the side a your wall poster. Right click and save the image to a file. Find vital wedding planning checklists in the newly released wedding planner and organizer Fimark's My Keepsake Wedding Planner. Fimark's My Keepsake Wedding Planner. Enjoy the May and June Bride Special for a limited time. List Price: $29 Now $26.65 here.